[H,wout] = freqresp(sys) returns the frequency response of the dynamic system model sys at frequencies wout. The freqresp command automatically determines the frequencies based on the dynamics of sys. H = freqresp(sys,w) returns the frequency response on the real frequency grid specified by the vector w.
H = freqresp(sys,w,units) explicitly specifies the frequency units of w with units. [H,wout,covH] = freqresp(idsys,...) also returns the covariance covH of the frequency response of the identified model idsys. Any dynamic system model or model array. Vector of real frequencies at which to evaluate the frequency response. Specify frequencies in units of rad/TimeUnit, where TimeUnit is the time units specified in the TimeUnit property of sys. Array containing the frequency response values. If sys is an individual dynamic system model having Ny outputs and Nu inputs, H is a 3D array with dimensions Ny-by-Nu-by-Nw, where Nw is the number of frequency points. Thus, H(:,:,k) is the response at the frequency w(k) or wout(k). If sys is a model array of size [Ny Nu S1 ... Sn], H is an array with dimensions Ny-by-Nu-by-Nw-by-S1-by-...-by-Sn] array. If sys is a frequency response data model (such as frd, genfrd, or idfrd), freqresp(sys,w) evaluates to NaN for values of w falling outside the frequency interval defined by sys.frequency. The freqresp command can interpolate between frequencies in sys.frequency. However, freqresp cannot extrapolate beyond the frequency interval defined by sys.frequency. Covariance of the response H. The covariance is a 5D array where covH(i,j,k,:,:) contains the 2-by-2 covariance matrix of the response from the ith input to the jth output at frequency w(k). The (1,1) element of this 2-by-2 matrix is the variance of the real part of the response. The (2,2) element is the variance of the imaginary part. The (1,2) and (2,1) elements are the covariance between the real and imaginary parts of the response. Compute the frequency response of the system. H is a 2-by-2-by-45 array. Each entry H(:,:,k) in H is a 2-by-2 matrix giving the complex frequency response of all input-output pairs of sys at the corresponding frequency wout(k). The 45 frequencies in wout are automatically selected based on the dynamics of sys. Create a logarithmically-spaced grid of 200 frequency points between 10 and 100 radians per second. Compute the frequency response of the system on the specified frequency grid. H is a 2-by-2-by-200 array. Each entry H(:,:,k) in H is a 2-by-2 matrix giving the complex frequency response of all input-output pairs of sys at the corresponding frequency w(k). 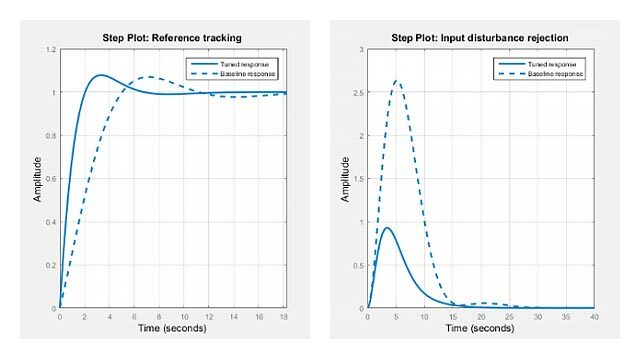 Compute the frequency response and associated covariance for an identified process model at its peak response frequency. Estimate a SISO process model using the data. Compute the frequency at which the model achieves the peak frequency response gain. To get a more accurate result, specify a tolerance value of 1e-6. Compute the frequency response and associated covariance for model at its peak response frequency. H is the response value at fpeak frequency, and wout is the same as fpeak. covH is a 5-dimensional array that contains the covariance matrix of the response from the input to the output at frequency fpeak. Here covH(1,1,1,1,1) is the variance of the real part of the response, and covH(1,1,1,2,2) is the variance of the imaginary part. The covH(1,1,1,1,2) and covH(1,1,1,2,1) elements are the covariance between the real and imaginary parts of the response. In discrete time, the frequency response is the transfer function evaluated at points on the unit circle that correspond to the real frequencies. freqresp maps the real frequencies w(1),..., w(N) to points on the unit circle using the transformation z=ejωTs. Ts is the sample time. The function returns the values of the transfer function at the resulting z values. For models with unspecified sample time, freqresp uses Ts = 1. For efficiency, A is reduced to upper Hessenberg form and the linear equation (jω − A)X = B is solved at each frequency point, taking advantage of the Hessenberg structure. The reduction to Hessenberg form provides a good compromise between efficiency and reliability. See  for more details on this technique. Use evalfr to evaluate the frequency response at individual frequencies or small numbers of frequencies. freqresp is optimized for medium-to-large vectors of frequencies. Laub, A.J., "Efficient Multivariable Frequency Response Computations," IEEE® Transactions on Automatic Control, AC-26 (1981), pp. 407-408.